The Sacrament of Baptism is often called "The Door of the Church," because it is the first of the Seven Sacraments not only in time, but also in priority. The reception of all other Sacraments depends on our having been baptized. Baptism is the first of the three Sacraments of Initiation, the other two being the Sacrament of Confirmation and the Sacrament of Holy Communion. Once baptized, a person becomes a Christian and a member of the Church founded by Jesus. We believe that the greatest gift, along with life itself, that a parent can give a child is the gift of Baptism where the child formally and permanently becomes a child of God and heir to eternal life. Further, the grace that comes to a person at Baptism continues throughout his/her entire life. Even if a person fails or drifts from the Great Commandment of loving God and neighbor, the grace of Baptism is working to bring him/her back to the Christian life. An unbaptized person simply does not have the beautiful spiritual advantages that come with Baptism. For those reasons, our Church never puts a fence between any person and the Sacrament of Baptism. Even if the parent(s) have not been coming to Church, our priests will welcome their child to the Sacrament of Baptism without placing any hardship or recriminations on the parents. We actually do not check a person’s church participation or contribution. 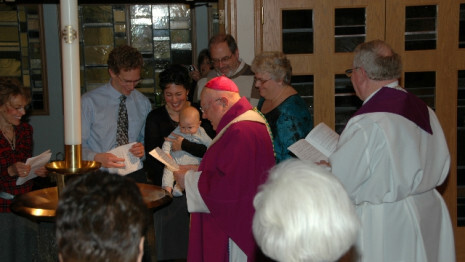 The parent and the child are simply welcomed to the Sacrament of Baptism. At Saints Peter and Paul, baptisms are normally celebrated during Mass, but other arrangements can be made. Christian initiation is the sacramental act by which the community welcomes others into its life. A major goal of our Church is to welcome all people to our celebration of the Sacraments and to be available to bring Jesus Christ and his saving grace to whomever asks at key moments of their lives, particularly for baptism, marriage, and funerals. Any parent who wishes to have his/her child baptized is invited to call our Church Office at (314) 270-2452 to discuss arrangements for Baptism of their child with a priest.